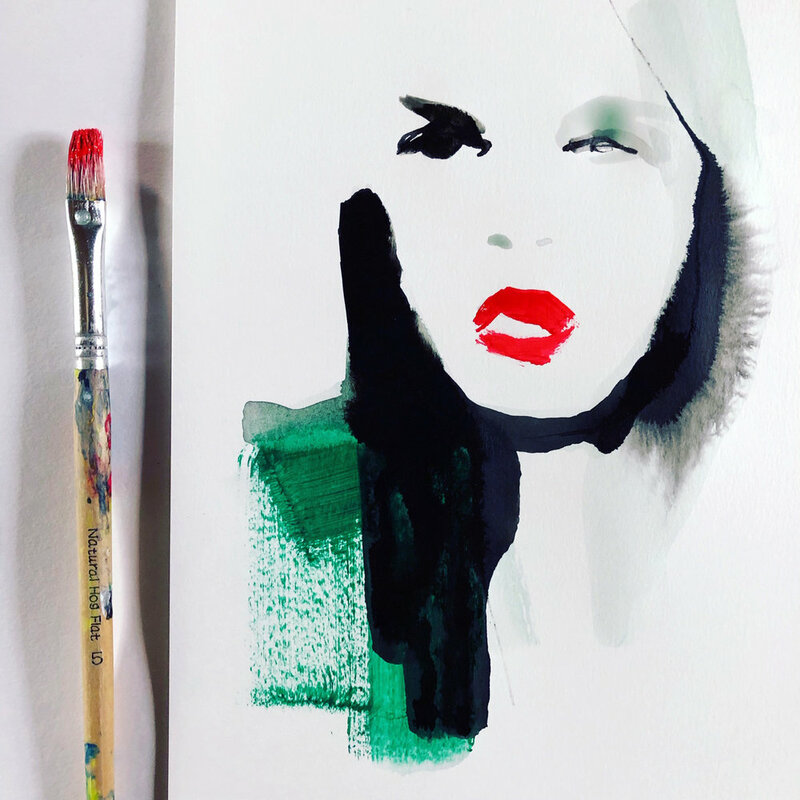 Love the simple yet fashionable brush strokes from Dutch fashion illustrator and live event sketcher Tessa M. de Graaf, also known as Tessaillustration. In her current work imperfection forms the main subject. 1. Hi Tessa, great to have you here. Tell us something about yourself. I am Tessa and I was born & raised in a small village in the North of the Netherlands. At the age of 18 I moved to Amsterdam to study fashion. I have met my husband (we are not married but more than 18 years together so ‘boyfriend’ sounds a little awkward) during a Sahara trip from Amsterdam to Dakar. After a few years living together in Amsterdam, we decided to move to Alkmaar. In the beginning I really missed city life but now I appreciate quietness and living close to the beach & forest with my husband, son and daughter. 2. How did you get started as an illustrator? Did you go to art school? I have been drawing my whole life. As a three-year-old girl, I was drawing all day long and when I turned 16 years I attended various courses in figure drawing. I studied at the AMFI (Amsterdam Fashion Institute) in Amsterdam. I also got a Master's degree in Fashion, Design & Strategy at ArtEZ in Arnhem. When I went to the academy, fashion drawing and figure drawing were my favorite subjects. After an internship at Cosmopolitan magazine I immediately started working as a freelance stylist. But Illustrating was what I loved most so after a few years of styling I decided to change course and started working as an illustrator. I focus on simplicity, less is more. I prefer working with my hands and don’t want to sit in front of a computer all day. I love to work with materials such as ink, watercolor, paint, crayons, pencils and paper. Coincidence plays a major role in my work. I completely rely on my intuition. I like to color outside the lines. In my current work imperfection forms the main subject. Before I start drawing I collect pictures from fashion magazines/ the internet (Pinterest/ Instagram). I don’t sketch with a pencil; I just create lots of silhouettes or faces with watercolor/ ink directly on paper. I love having the opportunity to express myself creatively and being able to inspire and delight people through my work. I love the creative process with these moments of struggling and seeing something unexpected and beautiful come to life. I simply can’t live without creating; it’s like meditation to me. Everything can be inspiring, for instance a conversation between people in the train, a walk on the beach, reading a book or browsing through a fashion magazine. I worked for clients like Swarovski, Bordeaux, Holland Herald magazine (KLM), Bijenkorf, Garcia Jeans, Glenfiddich, Batavia Stad Fashion Outlet. I mainly have been working for Dutch magazines and fashion brands. Now my kids are getting older and I have more time to spend so I would love to work with international clients as well. Definitely (an impression of) people: silhouettes & faces! That’s a really difficult question! I have so many ideas! I wish I could combine creating and traveling. I would love to draw backstage at fashion shows during the fashion weeks, create a big mural in a city like New York, for instance wall murals for hotels, shops or restaurants. I want to exhibit and sell original artwork more often. And I absolutely love to do live sketching at events. Being the connection between brand and customer when illustrating live is the most exciting thing there is for me! 9. What 3 things you can’t live without? Always follow your heart, turn your talent into a habit and practice every day. Tessa is giving away one signed print to the I love illustration community. What to do? Follow ILOVEILLUSTRATION and TESSAILLUSTRATION and TAG a friend on instagram and leave a comment why you should win this print!